The essential characteristics of the Scriptures may be summed up in these tenets: revelation because God has communicated His mind to men; inspiration because God has superintended the recording of what He communicated; canonicity because what is inspired is recognized; infallibility because what God intended to be written was recorded without error; authority because what is recorded is binding upon all men; necessity because man cannot do without what God says; sufficiency because what God has communicated needs no supplement; preservation because God has pledged for His Word to exist to all generations; and understandability because God communicated in order to be understood. While all these characteristics of the Scriptures are essential and significant, two of them relate directly to the routine task of the Bible translator: preservation and understandability. The other characteristics may impress the translator with the sacredness and value of the biblical texts and shape his philosophy of Bible translation, but they do not directly affect the routine, technical work of translating. They are inherent qualities that are set and permanent but are not active, so to speak. By contrast, whenever the Scriptures are translated into a new language, preservation is newly active. And whenever the Scriptures are studied, preached, or translated, understandability is also in operation. Both preservation and understandability of the Bible are acts of “fairness” from God. It would not be equitable that God would reveal His Word, render it binding upon all men, and then not make it available; or that He would make it available and not make it understandable. Throughout the ages, God has providentially preserved the copies of the Scriptures in the original languages. When one considers the opposition that has raged against God’s Word through the centuries, it is amazing that these copies are available at all. Even more, God has preserved everything that was originally written. Today, scholars may argue about a low percentage of the text of the NT as to which word or phrase rendering was originally written. That is primarily a problem of identification, not essentially one of preservation. Just as a believer’s sin does not affect the righteousness of God, likewise, possible divergences among copies of the NT highlight more the limitations of man rather than any hint of doubt in the faithfulness of God. Though preserved, the Scriptures would be irrelevant if they could not be used in a practical way. God’s purpose in speaking to men is that men might be fit and complete as God is complete (2 Timothy 3:16-17; Matthew 5:48). God has done everything necessary for man to be transformed to the image of His Son, Jesus Christ (Romans 8:29). And He presented His perfect plan in an understandable manner for men to comprehend it. That is what is called the doctrine of perspicuity or clarity of Scripture: God communicated to be understood! It can be put this way: All things being accounted for, the Scriptures are understandable. And as such, they are translatable. Translating the Scriptures is basically an act of transferring meaning from the texts of the Bible into a vernacular. Hence, the translator tries to comprehend the linguistic and biblical (theological) components of the Scriptures to transfer them accurately into another language. In turn, the reader understands what God intended to communicate. Are the Scriptures, then, both clear and unclear? How does that affect Bible translating? This is a thought to make understandable in my next column! By contrast, whenever the Scriptures are translated into a new language, preservation is newly active. I would be interested in an amplification of this thought in light of the difficulties of transferring with perfect precision from one language to another without later, when studying, referring back to the originals particularly for exegesis. Is it meant that, "what is able to be transferred is preserved" or something else? I can't remember if Part 2 delves into that question or not, but I believe it posts next week. Given that Hantz is a contributor to [URL=http://www.amazon.com/Gods-Word-Our-Hands-Preserved/dp/1889893870 ]God's Word in Our Hands[/URL ], I suspect his view is that God providentially preserves His word in varying degrees in translations as human beings do the work of translating. So, something like "what is able to be transferred is preserved to the degree translators are successful in doing their work." I think he would concede two factors there: the limits on translation itself, which is never able to fully capture in language B exactly what is in language A, but also factor 2: human error in the translation work, which God may or may not choose to mitigate in varying degrees for His own purposes. Both preservation and understandability of the Bible are acts of “fairness” from God. It would not be equitable that God would reveal His Word, render it binding upon all men, and then not make it available; or that He would make it available and not make it understandable. He lost me at this point. For by far the greater portion of biblical history, God purposely confined His word to one group of people. Even since the death of Christ to this day, the Word has never been available to all men. In fact, many believers throughout the centuries have had access to little of the written Word of God, either through lack of availability, active suppression, poor translation (Vulgate), or illiteracy. I would also be more cautious about "understandability," which I assume is the particularly unwieldy replacement for the obsolescent "perspicuity." One can understand something truly yet not exhaustively. We also need to recognize that there are difficult things in Scripture (2Pe 3:16), or we will be superficial and excessively individualistic in our Biblical interpretation. In any act of communication, there are two parties, the speaker and receiver. While I am quite confident in the abilities of the speaker, I must acknowledge that every receiver is at a different place both in spiritual and intellectual development. Yeah, I'm not sure what he meant there either. Probably just meant "acts of kindness." As I recall, English is not Hantz's native toungue. By the way, he has family in Haiti and last I knew he was trying to get over there. I'm sure he'd appreciate prayers. Edit: On second thought... I'm not sure "fairness" is the wrong word in that sense, though clearly it was not "available" to people on other continents, etc. for a very long time. Edit: On second thought... I'm not sure "fairness" is the wrong word in that sense. Aaron, he uses the word "equitable," so I assume that he is using "fairness" in the normal English sense. I'm just confused how God, to be fair, must do something that obviously He didn't do. I'm not sure if I agree that preservation is connected to translation. Okay, what is your basis for disagreement? Are we speaking of preservation in in the sense of preserving the message or preservation in preserving the text? From my understanding of what Dr. Bernard has written, I find his article to be balanced, insightful, thoughtful, and intriguing. However, there are many things that are not yet clear in such a brief article. I wait expectedly, without speculation, for the next installment. Let the man speak for himself. Aaron, it appear that translation is being viewed as an inferior sort of language study. However, our study of the original languages is a kind of "translation" from the original Greek and Hebrew spoken and written in cultural context and the academic Greek and Hebrew within the university or seminary context today. This is analogous to the English teacher, although having studied English seriously for many years, who has never heard or spoken the language. Her pupils will find English in an English-speaking country to be far different from their teacher's version. Can you confidently say that our reading of Greek and Hebrew is "able to fully capture" exactly what the original readers understood? I would say there are limits to understanding the original languages as well. Again, I would suggest that your two factors (i.e. language limitations and human limitations) are just as severe limitations in original language studies as these factors are in translation. I would be interested in your thoughts. Apprehension of what read (in any language) is one thing. Matching that to equivalents in another language is another thing. It's not that one is "inferior" to the other. One is just an additional layer of complexity. When we read, we apprehend one language. When we translate, we must apprehend two languages in addition to understanding how the one relates to the other. BTW, got word that Hanz is back from Haiti but is very busy dealing with family needs related to events there. So he sends his regrets. Charlie: yes, I believe you're right he is talking about "fairness" there. My observation about English not being his first language is true (he grew up with French and Creole), but off the mark in that his use of English is better than the average native English speaker by a pretty good margin! We'll have to wait and see what we can find out from him on several of the ideas here. This is analogous to the English teacher, although having studied English seriously for many years, who has never heard or spoken the language. Her pupils will find English in an English-speaking country to be far different from their teacher's version. Can you confidently say that our reading of Greek and Hebrew is "able to fully capture" exactly what the original readers understood? This example is ridiculous. What does "studied English seriously" mean if it does not include hearing or speaking? How did she teach pupils without speaking? Now, if the teacher was teaching "written English" then it's no surprise that her pupils couldn't speak conversationally. Speaking, listening, reading, and composition are all separate language skills which, though reinforcing, do not translate (no pun intended) with a one-for-one, or even very close, correspondence. I can read and write French passing well; for that matter I can read and write Koine Greek and classical Latin passing well. I couldn't carry on a 1-minute spoken conversation in any of those languages. However, I do know a few people who can actually speak Koine conversationally. Since we're talking about translating a written document, it's clear that the translation will transmit content accurately commensurate to the translator's facility in both the source and target languages. Modern academics do not have extensive facility in Koine as a whole language to the degree that a resident of Ephesus circa 100 AD would have, but they have achieved an adequate level of proficiency in such a restricted corpus as the NT and LXX to do the job, assuming facility in the target language. At base, you're making a category error. Understanding a language at various levels of proficiency is not the same skill as translation. If one grants the difference (and it seems implausible to deny it), then there certainly are limitations even on original language work. Whether they are "just as severe" as the limitations in translation is certainly debatable; but it is plausible to claim that our understanding is a long shot from the original audience's, and I think this must particularly be the case for people who only read the NT, which is like only reading a few letters and short novels and then claiming to well understand a language. Yeah, it's enough for content, in some minimal sense, but even written communication is a lot more than content in whatever that minimal sense is. I hardly these facts are groundbreaking or terribly important, but in asserting them RPittman is hardly transgressing the bounds of common sense and plausibility, nor does his slightly implausible example obscure his intention. Can you confidently say that our reading of Greek and Hebrew is "able to fully capture" exactly what the original readers understood? I would say there are limits to understanding the original languages as well. If I may also respond. If the argument is being made (and it appears this is the construct of the proposition with which an appeal is being made) that because we cannot, due to our limits, "fully capture exactly what the original readers understood" we must then alter our view and approach regarding the original languages vs translations (particularly in our own language), I would respond with the somewhat glaring observation that our limits aren't a relief for us from our responsibility to reference our source (Greek and Hebrew manuscripts) which is in fact the very source from which whatever translation one is using, is derived. And with that said, it seems to beg the question as to whether this would then actually lower the value of the English translation (or any translation) by conceding that translators could not have "fully captured exactly what the original readers understood" and points to the need of further investigation, discovery and amplification by way of none other than the Greek and Hebrew texts. Alex, you are way off track about where I am going with this. No, I am not arguing for any less rigorous approach to Scripture whether in the original languages or in translation. However, I am trying to shift the paradigm. which is basically the Modernist (Modernity) epistemological view. The ironic thing is that Fundamentalism swallowed the Modernist epistemology (i.e. scientific rationalism methodology) meanwhile rejecting the result (i.e. Higher Criticism). It seems to me when the preacher says, "Now in the Greek............" that he is getting ready to pull a theological rabbit out of the hat. Ofttimes, he spouts some irrelevant etymological derivation that has absolutely nothing to do the meaning of the word in its contextual usage. (For an example in English, the holder of a baccalaureate degree probably has nothing to do with laurel berries or knighthood.) IMHO, the Koine Greek was the ordinary language utterly devoid of special theological nuances and hidden esoteric meaning. As theologians, we overload ordinary words with semantic content and lose the simple, straightforward intentional meaning of the usage. May I suggest that Scripture has been preserved not only in a text but it is preserved in a received text with an attendant theological perspective to preserve its theological intent as the semantic content of words have changed? (I know this sounds like Roman Catholicism but it isn't.) In other words, I am suggesting a preserved message and text. Now, please don't make speculations about where I am going. You really don't know because I don't know. This is a work in progress that was begun years before this thread. My passion is epistemology and I have glimpsed the handwriting on the wall. Post-modernism is fast eroding Modernism's foundation of sand. IMHO, we are making a sad mistake if we continue building our arguments on the shifting sands of Modernist epistemology. The old rationalizations just won't bear weight anymore. Joseph made a correct assessment of my earlier post in response to Charlie's critique. Thank you Joseph for a balanced treatment. Whereas I intended to respond, Joseph has made an adequate response. The illustration, however, was taken from Brother Andrew's autobiographical account in God's Smuggler of his English teacher in Holland. Aaron, you are precisely correct in your observations. However, this does not negate my point. Aren't we being a little narrow and one-dimensional in our thinking by restricting revelation to the semantical content of words? Surely we are sophisticated enough to recognize the role of context and culture. Perhaps the Believing Church brings a kind of theological redaction to give the proper semantic content to translations. I am very intrigued by how the KJV came to give theological definition to English words even in secular literature. To put it another way, the theological orthodoxy of the Believing Church molds the translation into Scriptural orthodoxy. What do you think? Regarding the word prepared ( kuwn) in Ezra 7:10, a seminary Hebrew professor recently wrote: "The Hebrew verb refers to the careful investigation that only someone who knows Yahweh is privileged to undertake." I can find no justification for this in the Hebrew whatsoever. In fact, there is much to refute it when one considers the ordinary usage of kuwn (My Hebrew fonts failed to paste) in its 218 other occurrences. Now, this is precisely the state of our Biblical language arts to find signification and esoteric meaning in every Hebrew or Greek word. Thanks for your clarification and I do hope you appreciated my use of the conditional "if" in the "if the argument is being made" so as to communicate my intent was not based in an assumption, rather conditionally upon further clarification by you. Thanks for the interaction. I think I understand what you're getting at. But I'd say first, that "context and culture" are part of what determines the "semantic content of words." But is it possible that a kind of spiritual culture and context should be part of determining that semantic content as well? I think that was certainly the case. The apostles gave additional meaning to some words that the words didn't have before their use in the Christian context. But the words still mean what they meant to the original authors. How early believers understood them would be part of the process of identifying what the words mean in the biblical context. How we understand them today... or they understood them in 1611 would have to be secondary to how they were understood at the time of writing. I think I understand what you're getting at. But I'd say first, that "context and culture" are part of what determines the "semantic content of words." But is it possible that a kind of spiritual culture and context should be part of determining that semantic content as well? I think that was certainly the case. The apostles gave additional meaning to some words that the words didn't have before their use in the Christian context. But the words still mean what they meant to the original authors. How early believers understood them would be part of the process of identifying what the words mean in the biblical context. Herein lays the problem. Although I am in substantial agreement with the first statement, I am not persuaded that we can replicate the context through academic scholarship. Because we are not part and particle of their culture, how do we precisely know what the words spoke to these early believers? Most of what we know about these early believers is based on secondary sources. Thus, what we have as underlying data is someone’s perception of these early Christians. How we understand them today... or they understood them in 1611 would have to be secondary to how they were understood at the time of writing. The point is that we really don’t know how they were understood at the time of writing. Furthermore, we cannot verify that our present understanding of first century life, culture, and language is the way it really was. There is no benchmark. However, I am proposing that there is a line of orthodox teaching transmitted through the Believing Church that gives context and understanding to the text even in translation. Of course, there is the work of the Holy Spirit in the individual believer and collectively in the church. This, IMHO, is the essence of preservation. God’s sovereignty and preserving power works behind the scenes, invisible to the human eye and mind, to preserve His Word in both text and contextualization. It does not depend upon the conscious, intentional effort of human scholarship, although scholarship may or may not play a role at specific points. Finally, 1611 holds little signification, except possibly as opportune to the development of the English language, because we are speaking of process rather than a feat accomplished. The significance is not in the instance of translation but what the KJV is in the context of the Believing Church. Of course, I think my reference was to the KJV's influence on the language and secular literature. I'm understanding where you're coming from more now and appreciate your point of view. I'm interested to see if you think the KJV is somehow to be viewed as more "in the context of the Believing Church" than the NIV or ESV. If so, how do you come to that conclusion? I am not persuaded that we can replicate the context through academic scholarship. Because we are not part and particle of their culture, how do we precisely know what the words spoke to these early believers? Most of what we know about these early believers is based on secondary sources. Thus, what we have as underlying data is someone’s perception of these early Christians. I don't think I disagree with you here except that there seems to be an underlying assumption that we have to know precisely... and you've exaggerated a bit with "someone's perception." It doesn't come down to one person's perception by a long shot. And though we do not know "precisely," having not been there, we study in order to get increasingly close to "precisely" over time. The more hard data get's dug up and the more good scholarship is accomplished, the more confidently we can discern what is meant. It's interesting to me that now many of the linguistic battles are about nuances in categories that didn't even exist in the study a few decades ago (very few were talking about aktionstart in Greek studies, for example). This is because so much more of the language is understood, though there is still more to be figured out. In any case, it isn't true that we have to discern meaning either by linguistic studies or by "the believing church." As a result, the fact that there is uncertainty in linguistic studies does not argue for a "believing church" view of preservation that excludes study of the available facts. But there is a bigger problem, which Bob's question speaks to. I wonder if we might've overlooked the exemplar of the Scriptures in the area of perspicuity and preservation, esp. where the NT quotes the OT. Although marked and multiple textual variants exist between the NT's quotes and the OT Masoretic (often assumed closest to the autographs), the NT never regards its quotes from the OT as anything less than hai graphai, the Scriptures that are inspired of God and regarded as authoritative God's Word. Some might argue that those were not textual differences at all but translational liberties, which would only shed further light in the area of translational philosophy and technique. As for "understandability" or perspicuity, other than the parables of Christ (hidden to those who don't have an ear to hear) and certain hidden sayings in Revelation, the general direction of the NT (doubtless mirroring the OT's as well) would be in favour of aiding comprehension. Aramaic sayings are translated into Greek. Parallelism is used to reinforce messages. Similes and metaphors are used galore. The Word is regarded as light and not smoke or a shroud. Perhaps Bernard's arguing against those who insist on leaving things obscure on the basis of literalism, transferring idioms wholesale rather than interpreting and giving the sense, or perhaps using an alternate idiom in the target language. My suggestion would be that we have an exemplar in the Scriptures themselves. So why not base our positions on understandability and preservation on those? Part two posts real soon (maybe in about 40 minutes.) Perhaps that will help answer your question... I'm not entirely clear myself on what you're asking since it looks to me like Hantz is deriving his positions from Scripture. I'm not sure whether I agree or not but I do like the way you approach it. It is an interesting and thoughtful approach. I would be interested to hear your response to several questions. How do we determine whether the differences are textual differences or translational differences? 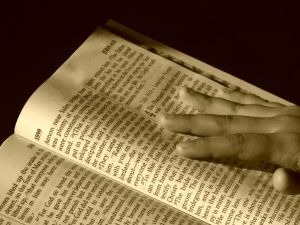 How do we know "the exemplar of the Scriptures" is intentional? How do we control for the varying interpretations of different translators? The ideas have some intriguing appeal but I would like to see more discussion and elaboration. You have hit upon something with the importance of "understandability and preservation." Let's hear more. Arrgh, I was hoping the question would be directed at a real expert, and there are some solid pillars on this board. Frankly, I don't have the answer and tend to vacillate. In any case, this is a question that merits closer investigation by the experts. Two responses to this: 1. We've been basing arguments on the exemplar of Scriptures for things like literary/aesthetic morality. Agreed, it's been assumed rather than proven, but that's been pretty standard practice. Of course, this is no excuse to reexamine the proof. 2. It's not the exemplar of the written Word only, but Christ's direct speech is an exemplar as well, as in the Luke 2 (cf. Isaiah 61) quotation, which He regarded as authoritative, to-be-fulfilled "Scripture." And we know we're to be conformed to His image and to follow in His steps. Three responses on this: 1. The historico-grammatico-literary method's pretty well established as a hermeneutical principle. So the mystical imagination-run-wild stuff's pretty much rejected. 2. The dynamic equivalence method, though much maligned, is scientific to an extent in the sense that it can produce somewhat predictable results over and again in the target language. I think this was correctly pointed out by Bernard in his chapter in God's Word in Our Hands. So it's not totally dependent on what the translators might've had for breakfast. 3. Given the obsession we've been seeing over literalism and formal equivalency in Fundamentalist circles, contra the OT quotes in the NT, I think we need to lighten up on "control." Say, which Fundamentalist school would let Jesus on its pulpit if it knew He was gonna read and preach outta His version of Isaiah 61? Thanks, but rather, I be all ears!